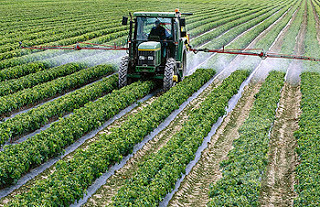 Dust insecticides and fungicides were first applied to plants by placing the dust in a thinly woven bag. The bag was then shaken over the plants. Later, bags were attached to each end of a pole so that a man riding a horse or mule, at a trot, along the row of plants could hold the pole and suspend bags over the rows and shake the dust from the bags onto the plants. A hand duster equipped with a hopper, fan, and discharge tubes was invented by W.R Monroe of Unionville. Ohio, in 1895. This duster (called sirocco) was converted to a horse-drawn and traction-powered machine about 1897. A gasoline engine was adapted to power-operate this duster in 1991. About 1920, hoppers, fans, and discharge tubes were mounted on horse-drawn carts to apply chemical dusts to cotton. Long, flexible metal tubes were arranged on booms so the dust was discharged over six to eight rows of plants. Tractor-mounted field dusters were developed in the late 1920s and early 1930s. Dusting equipment can be generally classified as field and orchard power dusters. Tractor-powered field dusters. A dusting unit mounted upon a platform bolted to the rear of a tractor and operated by the power takeoff. Operating the tractor in high gear makes it possible to dust a large acreage than with horse-drawn machinery of equal row capacity. Auxiliary engines are used on some tractor-mounted dusters to obtain more uniform power. The schematic drawing an agitator in the bottom of the hopper to keep the dust in a fluffy condition in order that it will be metered out uniformly through the feed system into the air steam. Tractor-drawn trailing dusters with power-takeoff drive and auxiliary-engine drive are available. Dusters of this type are easily attached to and detached from the tractor. They are suitable for small firms where one tractor is used to perform all cultural operations. Tractor wheel fenders are essential when either tractor-mounted or trailing sprayer and duster are used to apply chemicals to tall, wide-spreading cotton plants. Orchard power dusters. Most orchard dusters are operated by an auxiliary engine. Others can be mounted on the rear of a tractor or an trailer and driven from the power takeoff. Power units can also be mounted on the floor of a truck, thus saving the cost of a special sprayer chassis. Orchard dusters have only one large flexible metal hose, which can be turned to direct dust in any direction. Electronic duster. A company in texas claims to have developed an electronic attachment for ground field dusters. Research is being conducted to determine if this method of applying insecticides will increase yields. Airplane dusters. Airplanes have been successfully used to apply dust to both field crops and orchards. A hopper of holding 226.5 kg of calcium arsenate is built inside the fuselage in the space ordinarily occupied by the front seat. The opening in the top for filling is covered by a close-fitting lid, hinged in front. The dust in the hopper is stirred just above the outlet at the bottom by an agitator driven by a small propeller mounted on the wing. The feed consists of an opening across the width of the fuselage. A slide covering the opening is operated by pilot. The amount the feed valve is opened regulates the flow of the dust and determines the poundage applied per acre. A venture nozzle is mounted underneath the fuselage and the dust outlet. The rear end of the nozzle is tipped slightly downward. The blast of air created by the plane’s propeller rushes through the venture nozzle at a high velocity, catching the dust and discharging it in a whirling cyclindrical column that spreads and settles on the plants. It is claimed that the high velocity of air through the nozzle creates a partial vacuum in the feed opening, which aids the flow dust. An airplane can dust approximately 350 or more acres (141.7 hectares) per hour, which is many times the acreage that can be dusted with any other type of machine in the same length of time. Data kept on the time required for airplane operations show the average loading time to be 3 min 5 s, average flying time per load 14 min 30s, and the average dusting time per load 4 min 45s. about one-third of the time is spend in actually dusting, the remainder being consumed in turning and in flying to and from the landing field. 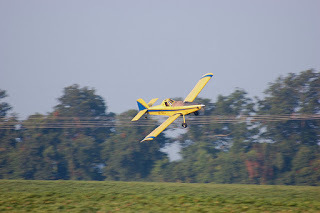 Chemical dusts applied by airplane to control weeds in rice fields may drift for several miles and injure other crops, such as cotton. Wind velocity will affect the drift distance. 1 Response to "Dusting Equipment"